Ask any serious animation fan to name their favourite animation studio, and you'll likely find that three names come up above all others. Ask any animator the studios that they most admire and those same three names will crop up time and time again: America's Pixar, Japan's Studio Ghibli and the subject of today's profile- the UK's Aardman animation. Founded in 1972 by Peter Lord and David Sproxton, the Bristol-based outfit has achieved many things in it's forty year history. Going from a two-man operation to the biggest animation studio in the UK, courting Hollywood studios and winning numerous awards (including four Oscars), it has had success after success. In Britain particularly, the studio has become a Household name, with their works meeting great success with audiences and critics alike. Their early years were spent mainly producing segments for TV, with the occasional short film produced on the side. Their first high-profile work was producing segments for the BBC children's programme Vision On, and later for the related series Take Hart and Hartbeat. 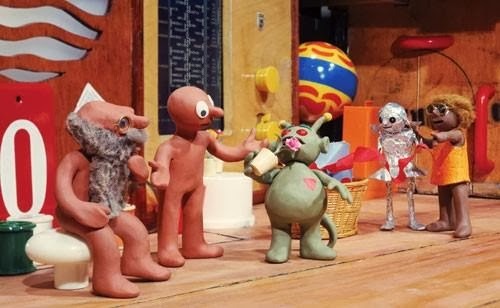 The latter two series were art-based children's programmes presented by the legendary figure Tony Hart, and introduced Aardman's first iconic stop-motion character Morph. Although there were other earlier successes (such as producing the much-lauded music video for Peter Gabriel's Sledgehammer) Aardman really took off when they took on a young animator by the name of Nick Park. 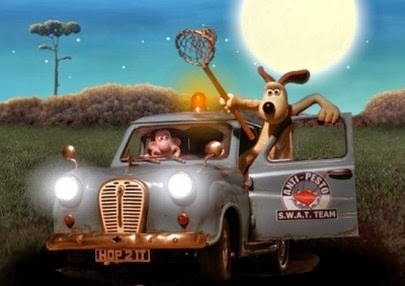 Park was taken on in 1985, when he was still working on A Grand Day Out, the first short to feature his now much-loved characters Wallace and Gromit. He had begun working on in 1982 as his graduation piece for the National Film and Television School. He would continue to work on it part-time (in addition to his other Aardman commitments) and it would not be released until 1989. The same year saw the release of another Park creation Creature Comforts. The classic short used a soundtrack of real-life interviews with members of the British public, re-purposed as a series of interviews with zoo animals. It also lead to a popular series of commercials for Heat Electric, and much later (in 2003) a TV series. At the 1990 Academy Awards, A Grand Day Out lost out in the award for Best Short Film. The film it lost to? Creature Comforts. The staggering achievement of being nominated twice in the same category would not be Park's last brush with Oscar either. The subsequent Wallace and Gromit shorts The Wrong Trousers and A Close Shave (co-produced with the BBC) took home the best animated short Oscar too. In 2005 the cheese-loving duo's first feature Curse of The Werereabbit won the recently introduced Best Animated Feature Oscar, bringing the tally for Aardman (and Park himself) up to four. Aardman was founded with the intention of making a stop-motion feature film, but it would be nearly thirty years until that dream would be a reality. In 1997 the studio signed a contract with Dreamworks (who were then several years away from their breakthrough animation Shrek) to co-produce and distribute several animated features. Stop-motion is a lengthy process so it wasn't until 2000 that the Great Escape riffing Chicken Run hit cinema screens. Wallace and Gromit made their big-screen début for the second feature length Aardman flick Curse of The Were Rabbit. The film was one of the best reviewed films of the year- animated or otherwise- and was a big box-office hit in the UK. However the money men at Dreamworks considered Wererabbit and the next year's Flushed Away (Ardman's first CGI animation) box-office hauls to be disappointing. Meanwhile, those at Aardman were unhappy with demands for creative control being made by the American studio. All these factors combined lead the two companies to dissolve their contract in 2007. Just a few month later Aardman found another partner in the form of Sony. Thanks to the extremely lengthy process of making their films we are only now beginning to see the deal bear fruit. At the end of 2011, the computer-animated Arthur Christmas hit cinema screens. The film was a moderate success on original release, but it was warmly received by critics, and may yet become a family favourite for the festive season. 2012 saw the release of the Pirates! In An Adventure With Scientists, the company's first stop-motion feature since 2005, and the first to be released in 3D. Two other features are currently in development so with the popularity of stop-motion riding at an all-time high, their future on the big-screen seems assured. Back in 2005, Aardman suffered a great set-back when a warehouse storing thirty years of props was lost in a fire. While this was a great shame, both for them and for all fans of animation history, luckily it didn't impact any of their ongoing productions. While Aardman have a past to be proud of, they continue to move forward. They have been winning over new generations of fans with TV shows like Shaun The Sheep and Timmy Time, while keeping their old fans happy by taking Wallace and Gromit back to TV. First shown on BBC2 over Christmas 1998, Rex caught some parents unaware. 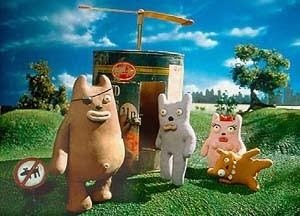 Assuming it was aimed at kids, this surreal series was actually Aardman's first stab at adult animated comedy, and lead to some angry letters to the BBC. Not that there's anything particularly shocking in it, unless you're offended by cartoon dogs saying words such as “crap” and “bum” at regular intervals. Brilliantly surreal, the 10 minutes shorts follow the adventures of the titular wibbly dog Rex, his friends Bad Bob and Wendy and their pet dog (!) Vince. Taking in time travel, journeys through space (and Vince, in a shrunken submarine) it also featured some awesome guest voices including Eddie Izzard, Phil Jupitus and Jonathan Ross. A second series followed in 2001. 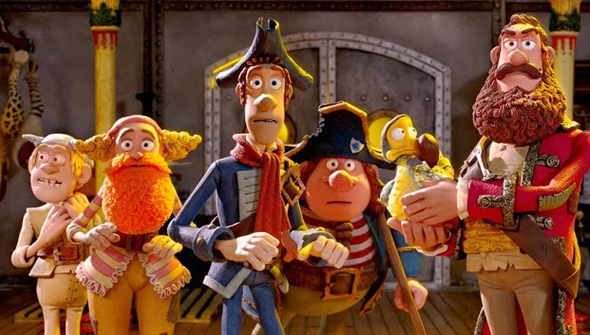 Wallace and Gromit had to feature on this list, and Aardman's sophomore theatrical release is arguably their finest hour. Beautifully made and laugh out loud funny, it might just be Aardman's greatest work too. Like the shorts before it, Park drops in plenty of references for the seasoned cinéphile. The plot and the execution pay loving homage to classic horror movies (think Universal and Hammer) which helps to give the whole affair a timeless feel. There's plenty of straight-forward comedy for the younger audience too. Pure, unadulterated genius. Aardman's first feature-length outing nicely sums up the studio's appeal. Starting from a killer concept- basically The Great Escape with chickens- and executed in their trademark style, it's vintage Aardman to the last frame. Despite the Hollywood money (and the presence of a pre-meltdown Mel Gibson) it feels just as British as their earlier output. The original short that won Park his first Oscar, was a simple idea but a brilliant one. Using 'vox pops' interviews with the public, and putting them into the mouths of claymation zoo animals, the results were funny and sometimes moving. The 2003 TV series was good too, but the original is still the best: especially the family of Polar Bears.